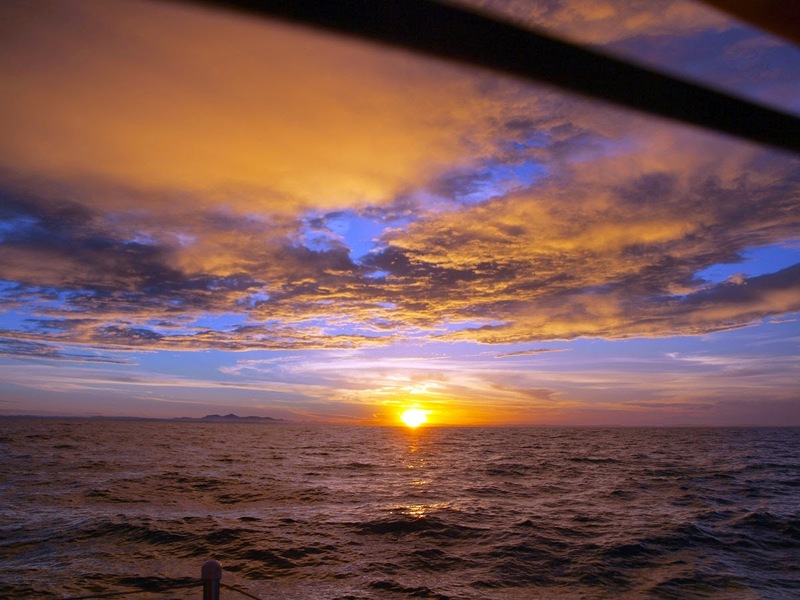 After ten days waiting out the SE gales on Magnetic we were on our way again, after the first 24 hours close hauled and one tack the wind backed to the north and Ashiki commenced a glorious reach toward Airlie Beach. We made the 124 Nm in under two days, the last 24hrs covering a creditable 85 Nm, and approached the built up resort town of Airlie Beach at dawn. It looked like a mini Monte Carlo with buildings ascending the mountain slopes, an interesting place to explore maybe, but as we closed in the gloom we saw the boats at anchor, maybe a hundred of them, all heaving, bows violently rocking up and down against strong onshore Northerly. Not very appealing so we gave it a miss and try the other Airlie anchorage, Shute Bay which would be sheltered. As we rounded the point, the Northerly stayed as strong as ever and even though the sight of the Whitsunday Islands was tempting, we really didn’t want to waste this wind. Our mission was to get to NSW after all thus set Ashiki gull winged and surged on through the Whitsunday Passage at 5 to 6 knots. We can always explore these islands next year on the return voyage north. The winds increased throughout the day, and being behind us Ashiki, like most boats tends to roll side to side when sailing downwind in swell. To minimise this we ended up sailing with main only and 4 panels of the foresail sheeted in the middle. We anchored in Sandy Bay that evening, a few miles north of MacKay. The next morning the outboard stalled after weighing anchor and refused to start again. Seemed to be an issue with either flooding or fuel hose but I couldn’t coax it to do anything. The wind was very light and we ghosted along at 1.5 knots as I changed the spark plug. Without luck we crawled for 10 miles to a settlement called Bucasia on the chart, decided today was a dead loss as far as making miles were concerned and anchored, engineless, a mile off the beach. Bucasia turned out to be a Northern suburb of MacKay, we dinghied ashore and walked a mile to the local shops to stock up on fresh goods. At least we ate well that night, but I was confident the motor would start if I gave it a rest overnight, a rest from me attempting to start it that is, I had spent most the day yanking on the start cord and grew a new blister to show for it. Next morning the motor started second pull. Strange beast. It pushed us the 5 miles around the point in the sunny near calm conditions. Passing the thriving metropolis of MacKay to starboard, winds remained on the beam but light, but we were quite content to turn off the motor and cruise at 2.5 knots for the rest of the day, with 170 miles to go to Great Keppel Island. What was next was three days and two nights of gentle cruising, sunny days and nights of lightning thunder storms over the distant shore. This seems to be the rule over most of Australia, well the part we have cruised, is regular thunderstorms over land through summer months. Us being out to sea we avoid this electrical activity, but it is an entertainment each night. We passed over Viscount shoals, weaved through Northumberland Islands and rounded Shoal Water Bay. Not fast but at least we could hold the rhumb line, the gods still providing the NE winds we need. At one point the Tiller Pilot started acting strangely, changing course in a random manner. Susie thought it was a faulty connection under deck, I said nah, it’s Raymarine, their tiller pilot likes to recalibrate itself and act strange anyway. To placate her I pulled out the multimeter and checked the voltages around the circuit. 11.8V at the plug on deck and 12.8V at the battery. Well 11.8V isnt great but is still enough to run a tiller pilot, but why the one volt difference? I found a loose connection at the battery… Fixed that and TP resumed working properly. Doh! 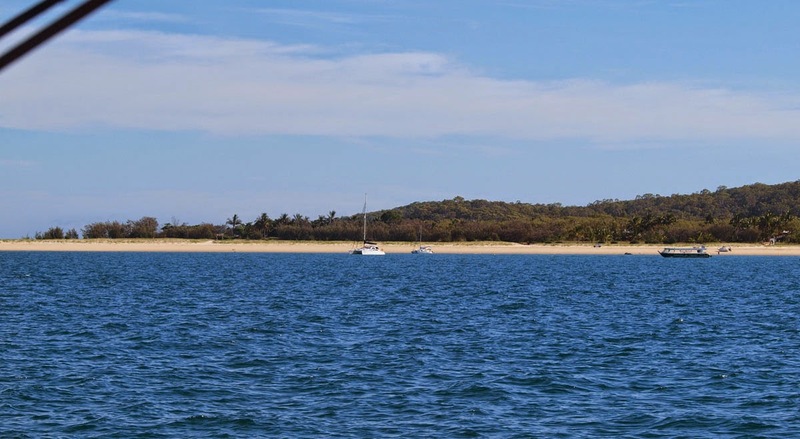 After entering the anchorage at North Keppel Island in the dark, we made the last six miles into the beach anchorage on Great Keppel Island the following morning, completing a 375 mile passage from Magnetic Island.